EVANSDALE — Sandra Kaye Allen, 65, of Evansdale, died Friday, Aug. 9, 2013, at the University of Iowa Hospitals and Clinics, Iowa City, from complications following surgery. 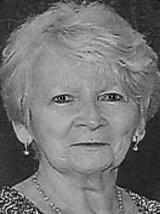 She was born Sept. 17, 1947, in Waterloo, daughter of Stanley and Marion Miller Krall. On Dec. 22, 1965, she married Larry Allen. He preceded her in death. Mrs. Allen graduated from Waterloo West High School and was a member of the local garden club. Survived by three daughters, Lorie (Josh) Condon of Dysart, Jessica (Dean) Schilling of Waterloo and Tara (Todd) Kinder of Parkersburg; a son, Aaron (Brittney) of Evansdale; 11 grandchildren; five great-grandchildren; her mother, Marion Keegan of Cedar Falls; a sister, Verna (Jerry) Riesberg of Waterloo; and special friend, Russell Bodecker of Evansdale. Visitation: 1 to 4 p.m. Saturday at Parrott & Wood Chapel of Memories, an Overton Family Service, Waterloo, with a 4 p.m. time of sharing. Memorials in lieu of flowers, may be directed to the family for later designation. Sandra and her husband made their home in Waterloo where she took care of their four children. She loved shopping, drawing, crocheting, and her dogs. In recent years, she enjoyed bowling.